Question: Is building a second story addition onto a home feasible? I have a ranch home and am considering building a second story addition onto my home and am wondering how expensive it is to do. Answer: Building a second story addition onto a ranch home is feasible and many homeowners have done so. However, building a second story addition onto a single story home is a large undertaking and typically involves extensive planning and the use of an architect. One of the major items to consider is the disruption of your lifestyle and family. Frequently homeowners undertaking the building of a second story addition need to temporarily vacate the home while construction occurs. 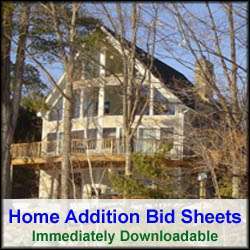 Consequently, temporary living costs need to be factored into the budget of building a second story addition. Regarding the actual construction and building of a second story addition, there are a number of issues that need to be addressed during the planning phase. First, the first floor construction needs to be evaluated to determine if it can support the weight of a second story addition. Second, the mechanical infrastructure (heating, plumbing, electrical) has to be evaluated to determine how it will be upgraded and modified to support the second story addition. Frequently larger furnaces and Electrical panels need to be installed. These upgrades can contribute significantly to the cost of the project. Finally, there is the demolition aspect of the project that needs to be thoroughly planned. In adding a second story addition it is important to remove the roof, without disturbing the structural integrity and contents of the lower levels. This can be tricky and requires significant planning and care. Otherwise, your second story addition project will expand to include a restoration project of the first floor. The cost of building a second story addition onto a ranch home is relatively expensive from a cost per square foot basis. Careful demolition, and temporary living expenses add significantly to the project budget. However the alternative to selling the home and buying a new one is even more expensive in most cases. A homeowner can expect to pay a 30-50% premium over standard construction costs per square foot, for adding a second story addition onto a ranch home.